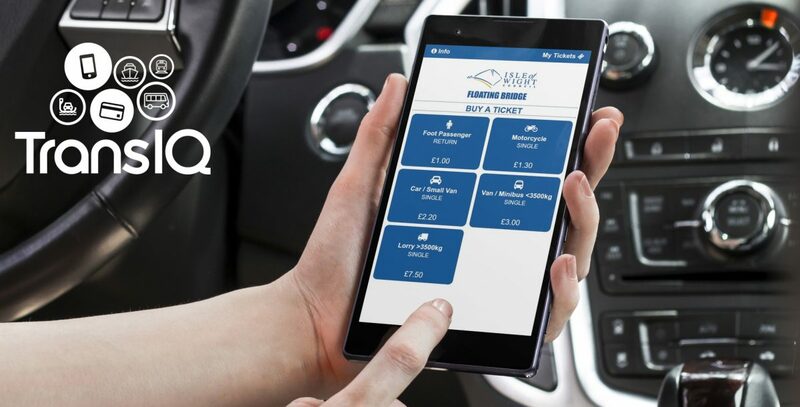 Today we launched a new mobile app for the Cowes Floating Bridge that allows customers to quickly and easily buy a ticket for their crossing using their phone – in three simple steps, the customer has a QR code on their phone’s screen that can be scanned by the crew onboard just like a paper ticket. We have been providing the ticketing system for the Cowes Floating Bridge for a couple of years now, and over that time we have gradually upgraded the capability of their system. The new app is the latest upgrade to this phased upgrade. To begin with, we simply provided our waterproof handheld ticket machines for the crew on deck. These issued and printed single and return tickets and logged the money taken. The first big upgrade to the system came last year with the introduction of a Saver Card, this contactless RFID card gave regular users discounted travel of around 30%. At the same time, we worked with Parkeon to install Pay & Display style ticket machines at the top of the slipways. These allowed passengers to buy a ticket before boarding and we integrated the machines with our system so they produced a QR code ticket that could be scanned onboard with our handheld terminals and then reconciled to our cloud-based server. While the Saver Card was very popular, it was not suitable for visitors and non-regular users who still wanted to buy a simple single or return ticket on the day. To help resolve this problem we have launched the next system upgrade with our new mobile app. This allows visitors and non-regular users to buy a ticket in the ferry queue using their phone, or if they prefer from their computer before they travel. The web app will be promoted to visitors (around the island and in suitable publications), as well as to passengers / vehicles in the queue, and can be accessed via a short URL customers simply type into their phone (iowfb.uk). The mobile app’s simple three step process allows them to choose a ticket and then pay using PayPal, a debit/credit card or – if they don’t have a card or cash with them – the can even pay via their mobile phone bill. The phone displays a barcode ticket that they can show to the crew as they board just like a paper ticket. The whole process usually takes less than 30 seconds, which means a ticket can purchased for just before boarding – avoiding queues and delays at the quayside ticket machines. The launch of the new app coincides with the new floating bridge, number 6, going into service. The way people “pay for stuff” is changing at a significant pace, and at TransIQ we are keen to make sure we deliver technology to our customers at the right time in the development cycle. Our clients don’t want to be an early adopter, but at the same time, they don’t want to miss out on a useful technology if it is going to provide a benefit to their business and make it easier for their customers to travel on their services. Our new Quick Ticket app is the latest example of how we put those principles into practice. If you think your business could do with upgrading it’s ticketing infrastructure then please get in touch.